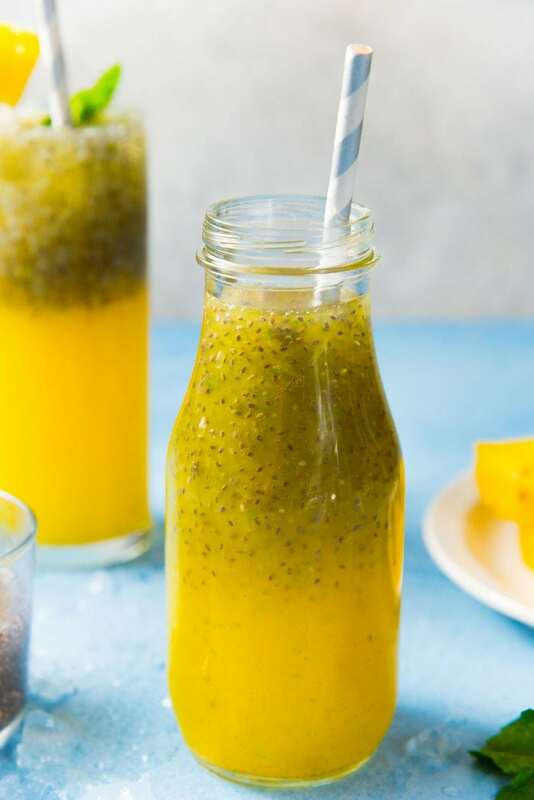 This simple, gorgeous Vanilla Pineapple Chia Fresca is fruity, refreshing, and surprisingly filling with the added nutritional value of chia seeds! After a couple of weeks of misplaced January weather at the beginning of April, and a sprinkling of snow over the weekend, the weather warmed up today for the first sign of spring! And I responded in the best way I knew. By busting out one of my favorite warm weather drinks – this gorgeous Vanilla Pineapple Chia Fresca! This will be the first of many chilled, refreshing drinks that I’ll be sharing with you guys over the next few months. 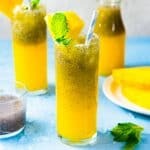 I thought I’ll start with this, since this pineapple chia fresca is a really refreshing and healthy summer drink, with fresh pineapple flavor, a hint of vanilla and lime, and a generous dose of chia seeds! Chia seeds are quite similar. They too become gelatinous and chewy when soaked in water, but that jelly layer isn’t as thick as with basil seeds. The nutritional value of these two types of seed are also different. Chia is known to be the more nutritious of the two. 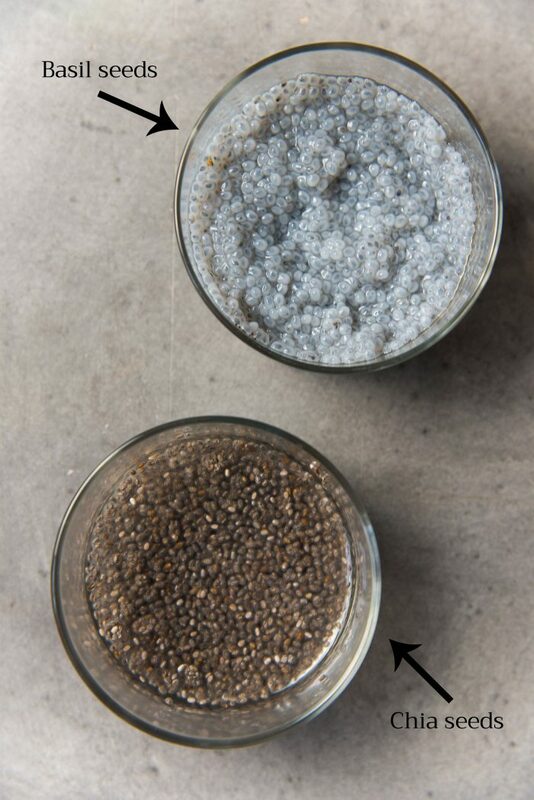 The difference between unsoaked basil and chia seeds. 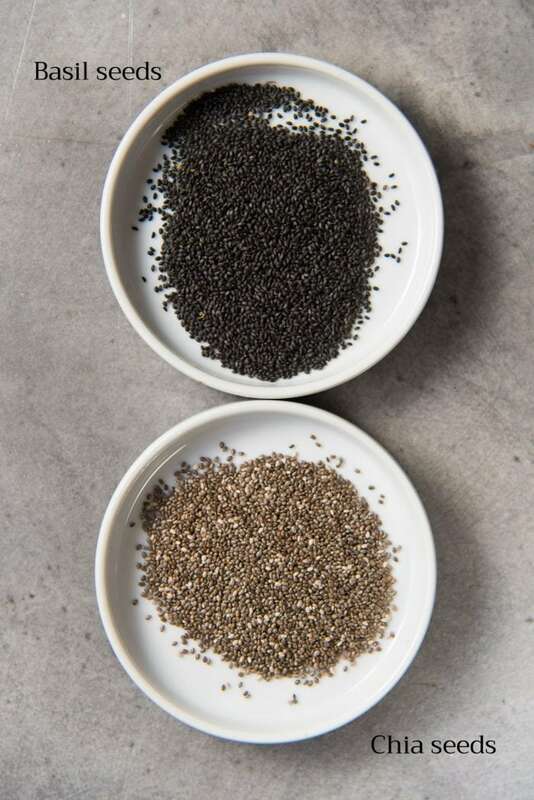 Basil seeds are black in color, while chia seeds are brown and mottled. 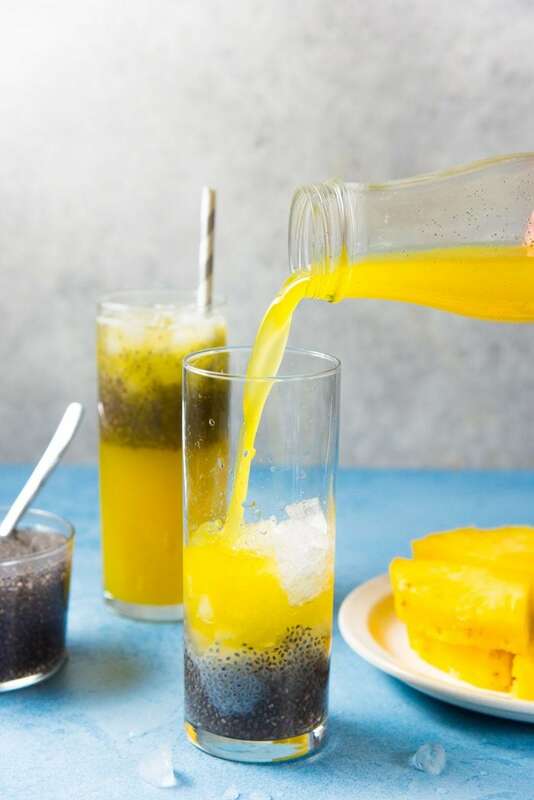 You can make this vanilla pineapple chia fresca in one of three ways. Juice fresh pineapple with your juicer (a slow juicer or a centrifuge juicer). 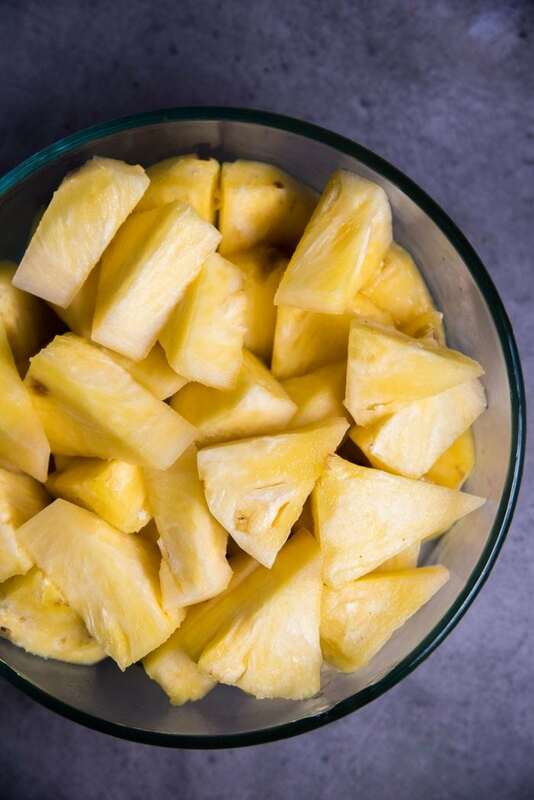 Place the pineapple in your blender and then pass it through a sieve to remove the pulp (you may need to squeeze the pulp to get the juices out). Or you can buy 100% natural pineapple juice from your local market. Alternatively, you can get your local market to juice a fresh pineapple for you too. If you’re buying pineapple juice, do check the label to make sure there aren’t other additives. The lime zest, lime juice and agave syrup enhance the freshness and sweetness of the pineapple. The agave (or sugar) is completely optional, and the amount of it that you add will vary depending on how sweet your pineapple is. 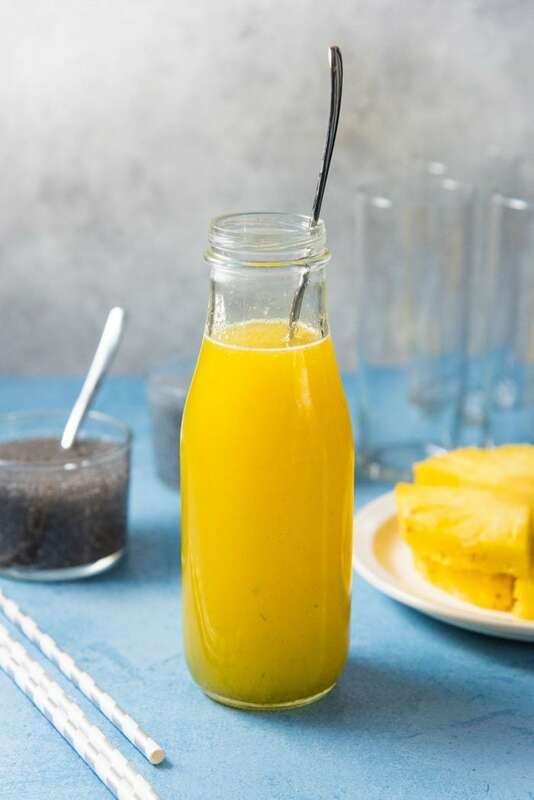 The natural vanilla bean extract serves as a natural sweetener for the pineapple juice as well, so make sure to taste your pineapple chia fresca before you add any sweetener like agave or sugar. The chia seeds are soaked in water for about 20-30 minutes to let them form that gelatinous layer. Basil seeds on the other hand will become jelly-like much faster than chia seeds, and will swell more in size as well. 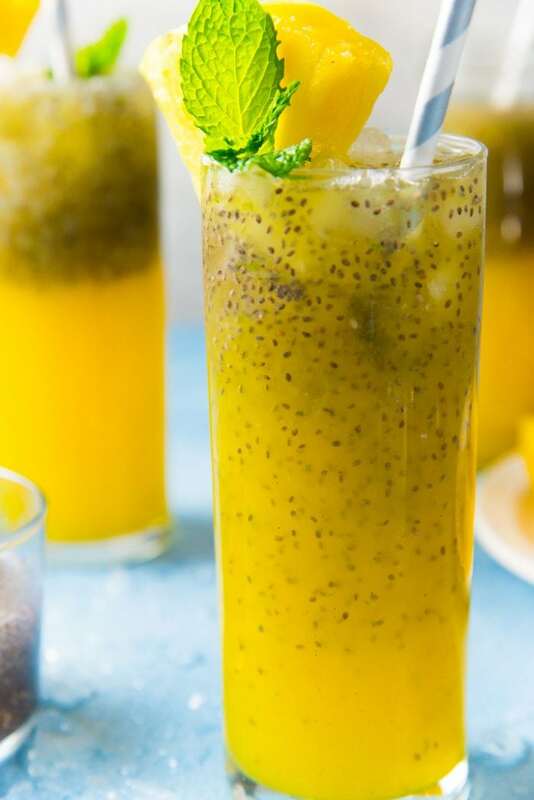 The addition of chia seeds (or basil seeds) makes this vanilla pineapple chia fresca surprisingly filling. 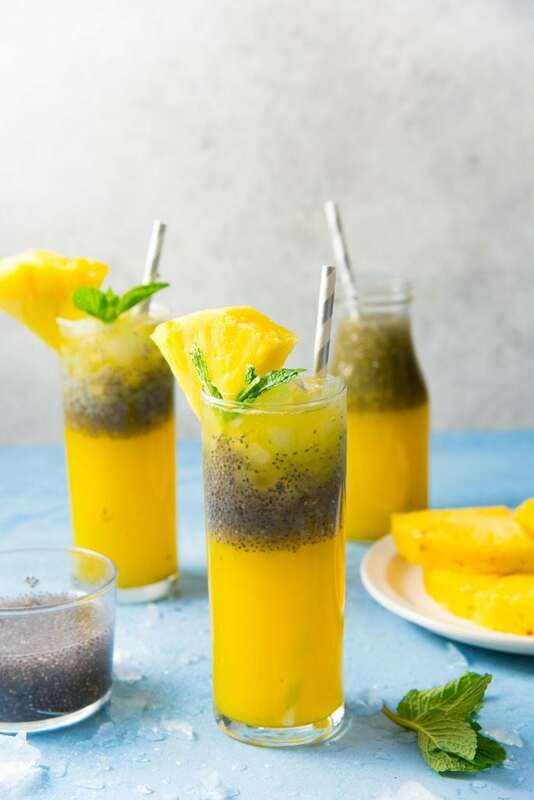 Plus, with all the nutritional value of chia seeds – such as omega-3 fatty acids, protein, fiber, calcium, antioxidants, and other vitamins and minerals, this pineapple chia fresca also gives you a nice boost in energy while helping you cool down. This pineapple chia fresca isn’t overly sweet, and it’s , fruity, refreshing and tart with a hint of floral flavor. They are perfect for spring/summer parties and picnics. 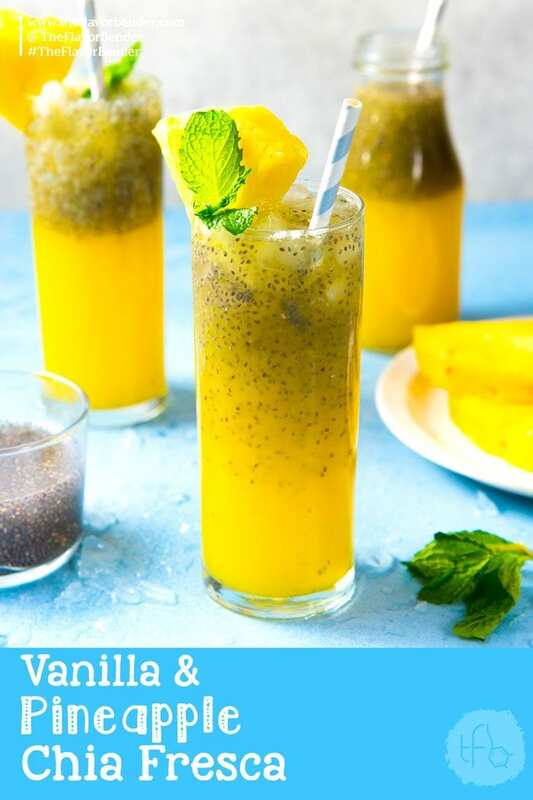 Vanilla Pineapple Chia Fresca - a fruity, refreshing, and surprisingly filling drink with the added nutritional value of chia seeds! Juice the pineapple pieces in your juicer. Add the lime juice, lime zest and vanilla, and mix well to combine. Taste and add agave syrup only if needed. Refrigerate until needed. You should have about 3 cups of juice. Add the pineapple and lime juice into the blender. Blend until smooth. Pass the pineapple through a sieve to separate the pulp. Use the back of a spoon to press the the pulp in the sieve to extract all of the juice. Mix in the vanilla and zest. Refrigerate until needed. You should have about 3 cups of juice. Mix lemon juice, zest and vanilla with 3 cups of pineapple juice. Stir and keep refrigerated until needed. Place the water in a bowl and sprinkle the chia seeds on the top. Stir to combine. Whisk the chia seed mix every 5 minutes to break up any clumps. They will be fully soaked in about 30 minutes, but you can leave it in water for longer. In a glass, add some chia seeds to the bottom. Top with some crushed ice and then pour the chilled pineapple juice over it. Stir to suspend the chia seeds. Garnish with mint and serve. 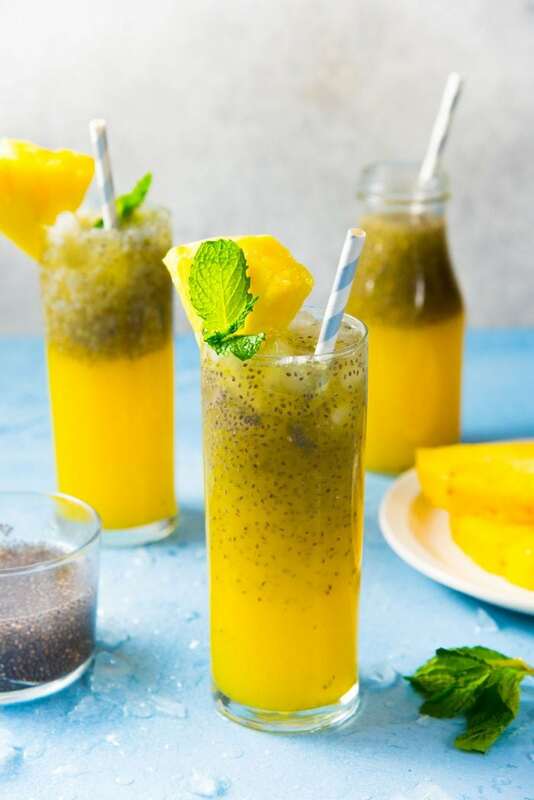 If you liked this vanilla pineapple chia fresca recipe, don’t forget to subscribe for new (and free) recipes by entering your email address on the side bar (and get all these recipes delivered straight to your inbox), so you don’t miss out on a thing. You can find me on FACEBOOK, TWITTER,INSTAGRAM, PINTEREST, YOU TUBE and GOOGLE-PLUS too.